The first Asian immigrants were Chinese men attracted by the California gold rush in the mid-1800s. Maxine Hong Kingston’s China Men tells the story of these first immigrants. Japanese men began arriving in the late 1800s. However, laws passed in the late 1800s and early 1900s excluded most immigrants from Asia. These laws also prevented Asians already in the country from becoming naturalized citizens. The passage of the Immigration Act of 1965 allowed many more Asians to enter the U.S. As of 2010, about 5% of the U.S. population identifies as Asian (Census Bureau data). Chu, Louis (1915-1970) — Chu was born in Canton and immigrated to the U.S. at the age of nine. He grew up in New Jersey. Chua, Amy (born 1962) — Chua was born in Illinois and raised in Indiana. Her parents are Chinese from the Philippines. Jen, Gish (born 1955) — Jen was born and raised in New York. Her parents immigrated from the Shanghai region. 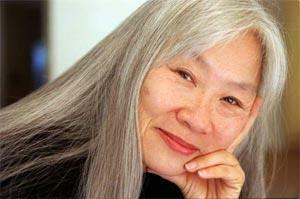 Kingston, Maxine Hong (born 1940) — Kingston was born and raised in Stockton, California to immigrant parents. Many of her books combine fiction, memoir, and history. Lee, Li-Young (born 1957) — Lee was born in Indonesia to Chinese parents. They fled Indonesia when Lee was two, and finally settled in the U.S. when he was seven. He is best known as a poet, but he has written a memoir. Lord, Bette Bao (born 1938) — Lord was born in Shanghai and immigrated to the U.S. when she was eight. She grew up in New York and New Jersey. Lowe, Pardee (born 1905) — Lowe was born and raised in San Francisco. He wrote one of the first memoirs (published 1943) by a child of Chinese immigrants. Namioka, Lensey (born 1929) — Namioka was born in China, and moved to the United States at the age of nine. Ng, Fae Myenne (born 1957) — Ng grew up in Chinatown in San Francisco. Her parents were immigrants from Guangzhou, China. Tan, Amy (born 1952) — Tan was born in Oakland, California to immigrant parents. Wong, Jade Snow (1922-2006) — Wong was born and raised in San Francisco’s Chinatown. Her immigrant parents had nine children and ran a garment factory in their apartment. Yang, Gene Luen (born 1973) — Yang was born in California. His parents are from Taiwan. Yang, Kao Kalia — Yang was born in a refugee camp in Thailand. She immigrated to Minnesota at the age of six. Ali, Samina — Ali was born in Hyderabad, India, and immigrated to the U.S. at the age of six months. Banerjee, Anjali — Banerjee was born in India and raised in Canada and California. Ganesan, Indira (born 1960) — Ganesan was born in Srirangam, Tamil Nadu, India, and moved with her family to New York at the age of five. Gowda, Shilpi Somaya — Gowda was born and raised in Toronto, Canada. Her parents are immigrants from Mumbai. Hajratwala, Minal (born 1971)– Hajratwala was born in San Francisco, and raised in New Zealand and Michigan. Her parents are from India and Fiji. Hidier, Tanuja Desai — Hidier was born and raised in Massachusetts. Jacob, Mira — Jacob grew up in New Mexico. Lahiri, Jhumpa (born 1967) — Lahiri was born in London, U.K. and grew up in Rhode Island. Her parents are from Calcutta. Meminger, Neesha — Meminger was born in Punjab, India, and immigrated to Toronto, Canada at the age of five. Patel, Neel — Patel grew up in Champaign, Illinois. Reddi, Rishi — Reddi was born in Hyderabad, and immigrated to the United Kingdom and then the U.S. as a child. Sreenivasan, Jyotsna (born 1964) — Sreenivasan was born and raised in northeastern Ohio. Her parents are from Bangalore. Houston, Jeanne Wakatsuki (born 1934) — Houston was born in California. Her mother was a second-generation Japanese (born in Hawaii), while her father was born in Hiroshima. Mori, Toshio (1910-1980) — Mori was born in Oakland, California to immigrant parents. His works of fiction are considered among the first written by a Japanese American, and were published in the 1940s and 1950s. Murayama, Milton (born 1923) — Murayama was born in Hawaii. His parents were immigrants from Kyushu. Okada, John (1923-1971) — Okada was born in Seattle, WA. His parents immigrated from Hiroshima. Saiki, Patsy (1915-2005) — Saiki was born and raised in Hawaii. Her parents immigrated to work in the sugar industry. Sone, Monica (1919-2011) — Sone was born and raised in Seattle. Her immigrant parents ran a hotel. Uchida, Yoshiko (1921-1992) — Uchida was born and raised in California. Yamamoto, Hisaye (1921-2011) — Yamamoto was born and raised in California. Kim, Ronyoung (Gloria Hahn) (1926-1987) — Kim was born and raised in Los Angeles to immigrant parents. She is also known as Kim Ronyoung. Lee, Chang-Rae (born 1965) — Lee was born in South Korea. He moved to the U.S. at the age of three and grew up in Westchester, NY. Lee, Marie Myung-Ok (born 1964) — Lee was born in Hibbing, Minnesota. Lee, Min Jin (born 1968) — Lee was born in Seoul, South Korea, and immigrated with her family at the age of seven. She grew up in Queens, NY. Hagedorn, Jessica (born 1949) — Hagedorn was born in the Philippines, and moved to the U.S. at the age of 14. In addition to being a novelist, she is also a screenwriter and multimedia artist. Bacho, Peter — Bacho was raised in Seattle. Cao, Lan (born 1961) — Cao was born in Vietnam and moved to the U.S. with her family at age 13. Nguyen, Viet Thanh (born 1971) — Nguyen was born in Vietnam. He came to the United States as a refugee in 1975. He grew up in Pennsylvania and California. Pham, Andrew X. — Pham was born in Vietnam and escaped via boat with his family. He grew up in California.